28 Oct., 2015 Lin. Daily News: The Logan County Genealogical and Historical Society annual dinner/speaker program – Monday, Nov. 16. <-- click here for more. The event will be held in the fellowship hall of Zion Lutheran Church, 205 Pulaski St., Lincoln. Dinner will be served at 6 pm. Minnesota resident and Civil War historian Gary Blessman will present details and history of the 106th Illinois Infantry. The dinner/program is open to the public, with paid reservations due by Friday, Nov. 6th ($15.00/person...eadline Nov. 6th.) Reservation forms are available at LCGHS, 114 N. Chicago, Lincoln, IL, 62656, on Tues., Thurs. or Fri., 11 am to 4 pm; or mail/drop off information - including name, phone or email contact, and payment to cover the number of persons in your dinner/program reservation. Please call LCGHS, 217-732-3200, for further information. Oct. 19th Meeting: LDN: LINCOLN - The Logan County Genealogical and Historical Society welcomed wood carver John Sutton to their October monthly meeting Monday. Sutton is nationally known for his artistry with a knife and a gouge, creating intricate wood carvings that can be whimsical or serious. Sept. 21st Meeting: Do you have buttons stored in mason jars or in metal containers? Do any of them have collectible value? Do you know the history of buttons? Cheryl Baker of Emden, Illinois, will be the guest speaker at the September 21st meeting of the Logan County Genealogical & Historical Society. Cheryl has display boards that her Grandma Ruben put together in the 1950's and 1960's and some she has put together in her own collection. She will share the history of buttons dating back to 4000 BC and will tell how buttons are made and the composition of them. Cheryl will also tell which buttons have collectible value and which do not. Refreshments were served. Aug. 17th Meeting: Linda Charron of Lincoln was the guest speaker at the monthly meeting of the Logan County Genealogical & Historical Society on Monday evening. Charron has created a unique business making dresses from historical periods. While her original intent was to limit her creations from the 1830’s to the 1950’s, she has now ranged as far back as the 1700’s. 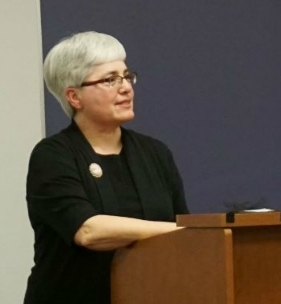 July 20th Meeting: Gail Leonard, educator for the Decatur Genealogical Society, Decatur, Illinois, will be the guest speaker at the July 20th meeting of the Logan County Genealogical & Historical Society. Gail's topic will be researching military records. Depending upon the time-frame and/or war, military records can provide a wealth of information. Some things you may find are date and place of birth, names of parents, units in which served, rank, awards/medals received, if wounded, if became a prisoner of war, if killed in action, if received bounty land, if received a pension, where buried, and how to check for records at both federal and state levels. The public is invited to join us at 6:30 pm at the LCGHS Research Center at 114 N Chicago St. in Lincoln. Refreshments will be served. Questions may be referred to Roseann Coers at 737-2534. 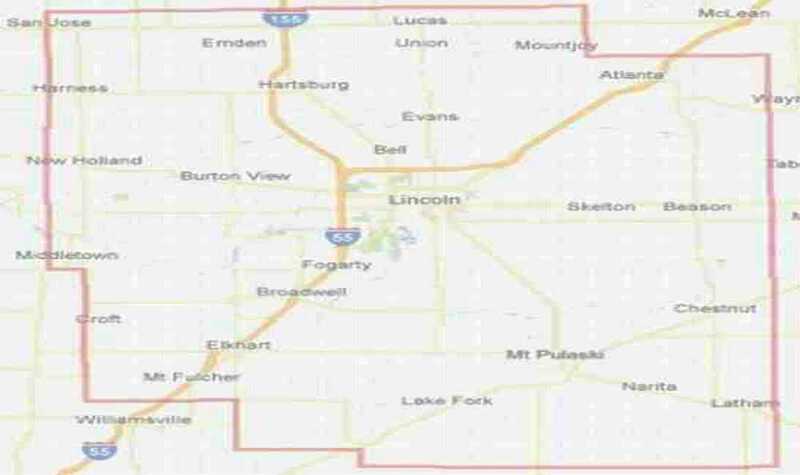 June 15th Meeting: Ed Block of Lincoln will be the guest speaker at the June 15th meeting of the Logan County Genealogical & Historical Society. Mr. Block was one of the original workers on the Elkhart Mine. His talk will cover the choosing of the design of work, why it was chosen, and what earth formations were found as they dug down. The public is invited to join us on June 15th at 6:30 p.m. at 114 N Chicago St, Lincoln. May, 18, 2015 Meeting: There will be a program about Martin White who was Logan County's first representative to the Illinois state legislature and served with Abraham Lincoln 1840-1842. The program will show where Martin lived in relation to the Trail of Death Indian March in 1838. The Pottawatomi passed through Springfield, Illinois, and ended in Miami County, Kansas, where Martin moved his family in 1855. He got involved in the border war that created Order No. 11 for three counties in Missouri. One of John Brown's sons was killed by Martin — in his role as a Justice of the Peace and as a Missouri State Guardsman — at the Battle of Wilson Creek, Republic, Missouri. The program will be presented by Dolores and David Rush of Grandview, Missouri. Martin is Dolores's 3rd great-grandfather. The Logan County Genealogical & Historical Society will meet Monday April 20 at 630 p.m. Olivia Thompson (5th grade), Caroline Ahrends (6th grade), Noah Butler (7th grade), and Madeline Steiner (8th grade) have been invited to read their winning essays in the LCGHS essay contest. The theme for the contest was, "My Favorite Quote by Abraham Lincoln, Why It's my Favorite Quote and How It Relates to Today." To continue in the observance of the 150th anniversary of Abraham Lincoln's assassination, death, and funeral, a copy of the book, "Twenty Days, A Narrative in Text and Pictures of the Assassination of Abraham Lincoln," written by Dorothy Meserve Kunhardt and Philip B. Kunhardt, will be given away as a door prize at the close of the meeting. The meeting will be held at the LCGHS Research Center at 114 N Chicago St., Lincoln. The public is invited to attend. Refreshments will be served. 15 April, 2015 New HeraldNews: In President Lincoln’s first namesake city, the Logan County Genealogical and Historical Society (LCGHS) commemorated this anniversary with a special program on Sunday, April 12. Hosted by the Lincoln Heritage Museum, the program included musical and interpretive performances as well as historical presentations. The Logan County Genealogical & Historical Society will observe the 150th anniversary of Abraham Lincoln’s assassination, death and funeral on Sunday, April 12, 2015, 2:00 p.m. Under the theme, “A Nation Mourns, April 15, 1865,” the event will take place at the Lincoln Heritage Museum. Charles Fricke will begin the afternoon with a narration, written by Paul Gleason, Logan County Historian, of the life and times of Abraham Lincoln prior to April 15, 1865. 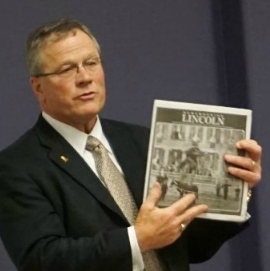 Ron Keller, Lincoln Heritage Museum Director, will present a PowerPoint presentation of national and local media coverage of President Lincoln’s death and funeral. Alexa Maxey, a Lincoln College student, will give a dramatic portrayal related to the Lincoln assassination and funeral titled “Louisa Hawes’s Story: How Logan County Mourned a President and Friend”. Paul Beaver, LC Professor Emeritus, will recount the funeral preparations and travel plans taking President Lincoln through the nation and home to Springfield, Illinois. The Lincoln Heritage Museum will NOT be open at the time of this program. The Logan County Genealogical & Historical Society will observe the 150th anniversary of Abraham Lincoln’s assassination, death and funeral on Sunday, April 12, 2015, 2:00 p.m. Under the theme, “A Nation Mourns, April 15, 1865,” the event will take place at the Lincoln Heritage Museum. Charles Fricke will begin the afternoon with a narration, written by Paul Gleason, Logan County Historian, of the life and times of Abraham Lincoln prior to April 15, 1865. Ron Keller, Lincoln Heritage Museum Director, will present a PowerPoint presentation of national and local media coverage of President Lincoln’s death and funeral. Alexa Maxey, a Lincoln College student, will give a dramatic portrayal related to the Lincoln assassination and funeral titled “Louisa Hawes’s Story: How Logan County Mourned a President and Friend”. Paul Beaver, LC Professor Emeritus, will recount the funeral preparations and travel plans taking President Lincoln through the nation and home to Springfield, Illinois. The Lincoln Heritage Museum will be open at the time of this program showcasing artifacts from the assassination and funeral of President Lincoln. 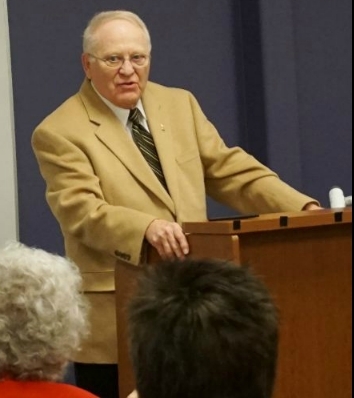 March 16, 2015, meeting: Dean Baker of Lincoln, Illinois, will be speaking on the History of U.S. Coinage at the March 16, 2015, meeting of the Logan County Genealogical & Historical Society. Mr. Baker will also have some ancient coins on display. The meeting will be held at the LCGHS research center, 114 N Chicago St., Lincoln, and will begin at 6:30 p.m. The public is invited to attend the meeting. Coin collectors, you won't want to miss this event. Please join us. Jan. 19th, 2015 Meeting: LDN: "What is It?" - Now a LCGHS annual tradition for the first meeting of the new year - membership enjoyed a fun and educational evening of guessing "What is it?" Topic will be 'What is this?"